AC MILAN TICKETS SEASON 2018/2019. 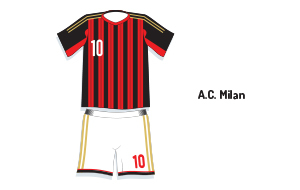 AC Milan is one of the best football clubs in the world with a great history. AC Milan finished 6th in Serie A table last season so they will play Europa League football this season. However, AC Milan features some world class football players such as Andre Silva, Mateo Musacchio, Ricardo Rodriguez and many others. In 2018/2019, AC Milan is aiming to win the Italian Serie A title once again. AC Milan has a big rivalry with Juventus, AS Roma and Inter Milan. Buy AC Milan tickets to see them playing at the amazing San Siro stadium, also known as the Stadio Giuseppe Meazza. 1st4 Football Tickets sells AC Milan tickets for home and away matches. See AC Milan playing at San Siro in Milan Italy! You can either buy your AC Milan football tickets online through our secure online booking system. This year, AC Milan will be a serious contender for the Italian Serie A title. See AC Milan at the San Siro Stadium, the ground which is shared with rivals Internazionale, is the largest in Italian football, with total capacity of 80,074. With world-class players AC Milan tickets are bound to provide you with some attractive football. Not only we have AC Milan tickets available for Serie A matches, but also we offer AC Milan Champions League tickets and AC Milan Coppa Italia tickets. All AC Milan ticket orders are 100% guaranteed. AC Milan have a loyal, enthusiastic fan base that fully supports the club at San Siro Stadium matches and away games. Devoted AC Milan fans travel to other cities to cheer for their beloved Milan side and favorite players! Join in the excitement and fun - sit with other Rossoneri fans and enjoy the match! You can buy tickets for AC Milan at 1st4FootballTickets.com securely online - or you can call our AC Milan football ticket hotline @ UK TEL: 0871 284 5277! Every AC Milan ticket order from 1st4FootbalTickets.com comes with a 150% guarantee, and will be delivered to your home, hotel, or office ASAP by our reliable partners FedEx and Royal Mail Special Delivery.